Back in 2014 national piling equipment supplier Piletec acquired its first ever Isuzu trucks, with the inaugural five 7.5tonne rigids working in its fleet on a four-year contract hire agreement through Isuzu Truck dealer Warrington Vehicle Centre. When the contract ended, Piletec automatically replaced these vehicles with a further five brand-new Isuzu Forward N75.190 4×2 rigids, based purely on their outstanding performance over the previous four years. In addition to these replacement five Isuzu Forward 7.5 tonners, Piletec’s parent company Vp plc is also taking delivery of a further six Isuzu Forward N75.190 rigids for its sister company Mr Cropper. These additional six new Isuzu trucks are due to be on the road in April this year and once again, they are being supplied through Warrington Vehicle Centre. “We had no hesitation whatsoever in going back to Isuzu Truck and Warrington Vehicle Centre when we were looking to replace the Piletec and Mr Cropper vehicles. 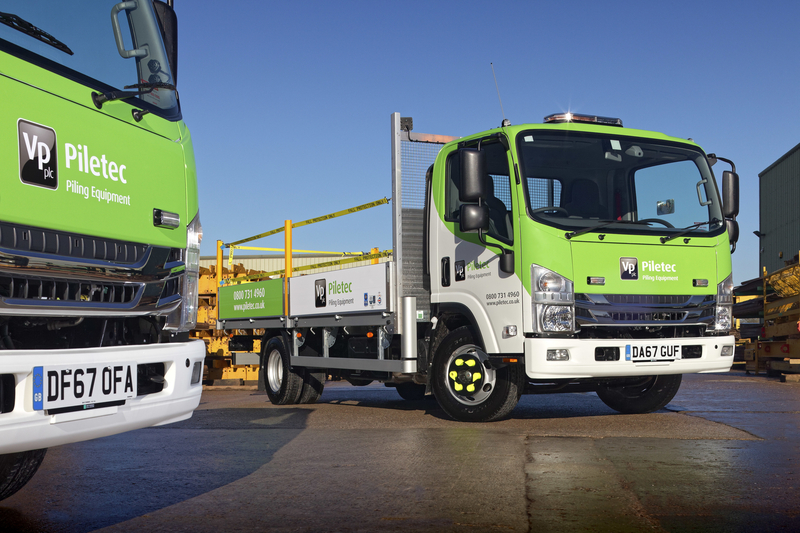 The Isuzus certainly earnt their money, however, we needed to ‘up spec’ the new trucks to be not only FORS compliant but also LEZ compliant, with the vehicles regularly running in and out of the London conurbation” added Darren Barton. The five Piletec 7.5 tonne Isuzus all feature the popular Easyshift automatic transmission and the trucks have been fitted with 16ft aluminium dropside bodies. They are now operating out of the Piletec depots in Wigan, Milton Keynes and Harlow, delivering piling equipment to numerous sites nationwide and Piletec anticipates that each vehicle will cover in excess of 40,000 miles per annum over the four-year period. Piletec is a specialist supplier of piling equipment to the construction industry, providing a comprehensive range of equipment for driving, extraction and foundation preparation projects. “Regular repeat business has been the foundation for the success of Isuzu Truck here in the UK and Piletec’s experience with its first Isuzus has now lead to a strong and successful long-term partnership between the two companies” said Pete Murphy, managing director, Isuzu Truck UK.